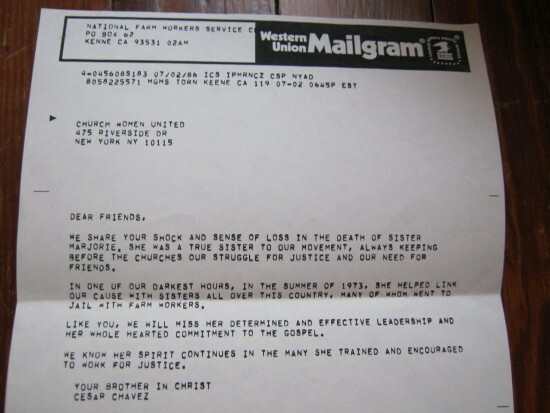 UFW Stories: "Mailgram foom Cesar Chavez sending his condolence for Sister Marjorie Tuite 7/02/86"
"Mailgram foom Cesar Chavez sending his condolence for Sister Marjorie Tuite 7/02/86"
My cousin, Sister Marjorie Tuite worked with United Farm Workers. I was a young, rebelious teenager at this time. I ran away from home when I was 15 (1974) to live in Porterville, CA where I was introduced to the awsome agriculture of the San Joaquin Valley.The impact of this experience has never left me! I had many lessons to learn and Sister Marjorie was a huge influence on the way I “think and see things today.” I signed up to recieve emails from UFW about 6 months ago. I am a nurse and have recently been looking at the possibility of working in health care with migrant farm workers. I am very proud of the work of Cesar Chavez ... and of the contributions and sacrifices my cousin Sister Marjorie, and so many others have made in the struggle for social justice. I treasure the words in this mailgram and keep them ... close to my heart.